Back at the beginning of November, I was one of the two club photographers for Quattrofest 2013 (more on that in an upcoming blog post) and needed a support vehicle to haul my equipment, provide a bit of cover in the rain and be able to go on both gravel and muddy stretches of grass. I was able to get a Q5 2.0TFSI as a support vehicle thanks to Audi Wilsonville. Although that Q5 was not the first one that I had driven, that honor goes to a Q5 3.0TDI at Sunset Audi, but it was one that I had for the longest period of time. Over the two full days that I had the Q5, there were a couple notes that made about it and wanted to publish them. 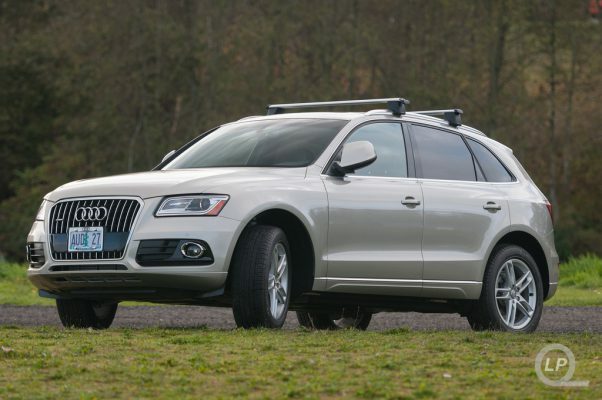 Even though the Q5, with the equipment and myself, weighed in at around 4400 pounds, the 2.0TFSI engine and 8-speed Tiptronic transmission still felt pretty peppy and did not feel underpowered under any condition. As with the power boot lids of the A6 and A8 or hatches of the allroad and A7, the hatch opens and closes too slowly. While it is mostly due to safety/liability concerns, being able to close it as quickly as possible in pouring rain would have been nice. The hatch’s open position lead to me hitting my head on it a good half-dozen times on the first day and another 3-4 times the second day. Those that are 6′ or taller may have to watch their head very carefully. The deep storage bin/arm rest compartment between the front seats was perfect to house a couple of portable hard drives or various power adapters. If one uses the 12V DC plug in the said storage compartment for a power inverter, there’s no real space to lay the power inverter other than on the floor behind or in front of the front seats. This lead to a rat’s nest of cabling when charging a camera and a laptop. The 12V DC port in the rear cargo area would have worked, but there was no clean way to route the power cable through the cargo cover or between the rear seats. It did work as a way to charge up batteries while cruising around the perimeter of the track. Having been used to sportier seats in the S5 for so long, the flat and wide seats that come standard in the Q5 didn’t feel right to me for the first day. Nonetheless, the seats are comfortable and provided a nice place to rest between shoots. I’m not sure if I like the feel of the higher seating position combined with the larger blind spots that comes with a crossover. The suspension was a bit on the floaty side, but that did help soak up a lot of the bumps, runts and lumpy grounds that I had to drive on to get to certain points just outside of the track. With the Q5 engine running to keep the battery from running down while working on my laptop and charging up equipment, if I left the Advanced Key in the car, stepped out and tried to unlock and open another door, it wouldn’t let me. I would have to open an unlocked door first, unlock all doors or have the Advanced Key with me. Usually it wasn’t a problem unless if it was pouring down. Between long periods of idling, low speed putting around and a lot of highway miles (with it in S mode), I was able to get a respectable average MPG of 20.2. I want to thank Audi Wilsonville for providing me with the Q5 as a loaner/support vehicle for covering Quattrofest 2013.